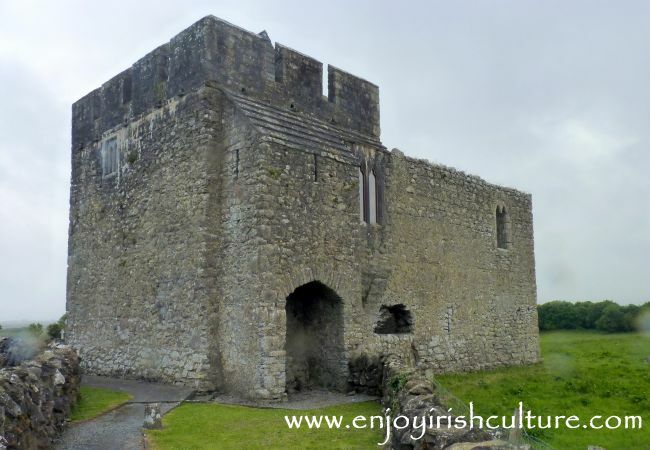 We hope you will enjoy browsing through the examples of tower house castles in Ireland on this page. 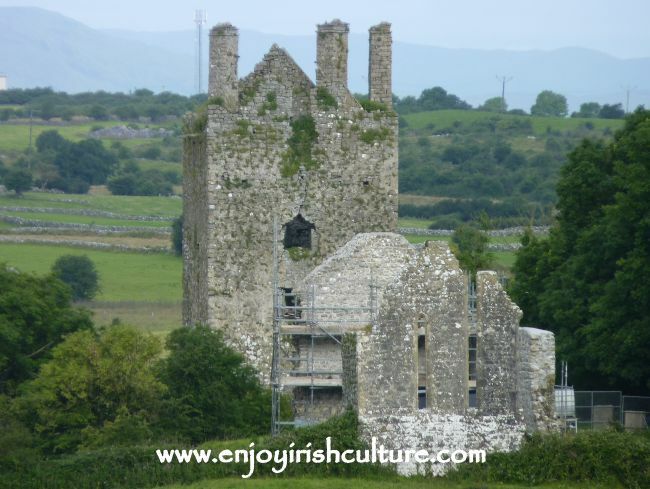 The magnificent ruin of Kinlough Castle and church, County Galway on the Shrule side Headford. The castle is well signposted and accessible. The castle ruin can be accessed with a small walk, but it is located on private lands. Church and castle seen here are divided by a river. Check out things to look out for when visiting castle ruins. 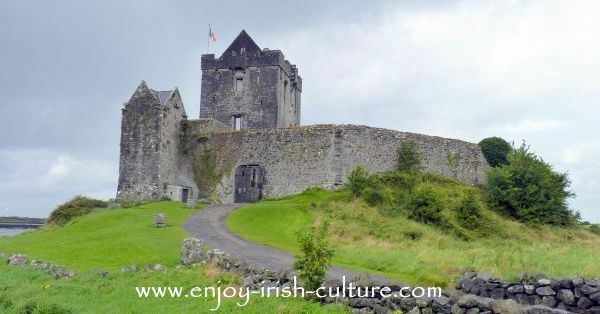 Above is Dunguaire Castle in Kinvara, County Galway is one of the best known castles thanks to the exposure it gets from medieval banquets run by the Shannon Heritage Company who also own Bunratty. It is a small, charming, 16th century build directly by the sea, used as a private residence up until mid 20th century. No better place. 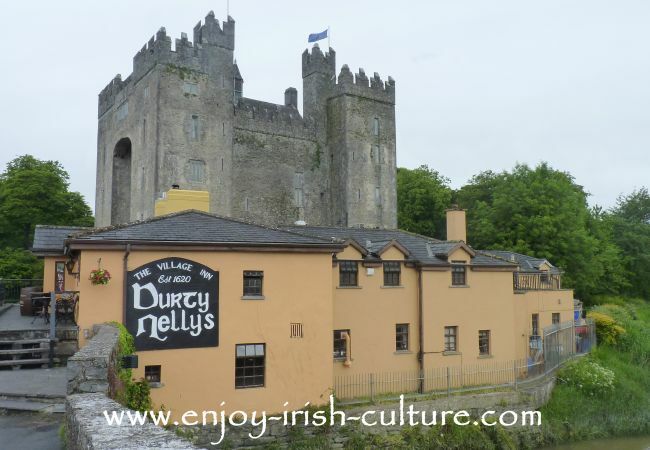 This is Bunratty Castle in County Clare, one of the quintessential castles in Ireland-the existing castle is a 15th century build and the fourth castle structure on this site, seen here behind one of Ireland's oldest pubs, Durty Nelly's. 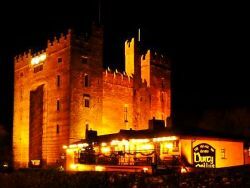 Bunratty is the 'grandest' of all tower houses in Ireland, back in medieval times as much as today. There are four towers flanking the central keep creating areas for the construction of private dwelling space which was in short supply in medieval times. A real rarity, preserved for the super rich. The castle features beautiful medieval furniture and treasures collected by Lord and Lady Gort who reconstructed historic Bunratty in the 1950ies. 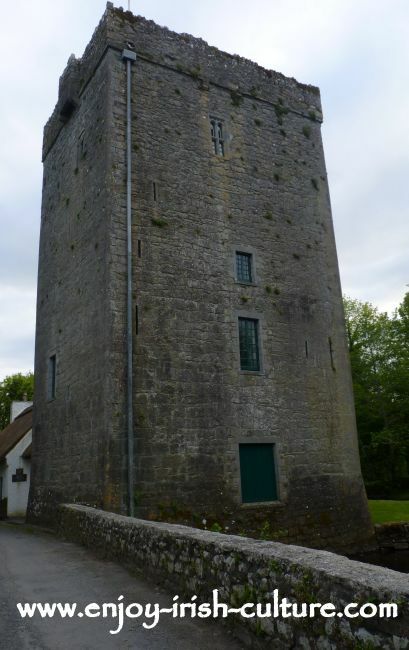 The photo above shows Thoor Ballylee in County Galway also known as Yeats' Tower after Yeats the poet who purchased the Irish castle in 1916 from his literary friend Lady Gregory for a small sum of money and made it his country retreat that brought him and his family much inspiration and happiness. Yeats reconstructed the building and installed larger windows on the bottom floors of the tower turning it into a comfortable living space, while retaining the original structure further up. It is somewhat unclear as to when the castle was built by the De Burgos, whether it was a 15th or 16th century build. Today the castle and adjoining cottage house a museum dedicated to the poet. Craggaunowen Castle near Quin in County Clare was a mid 16th century build by the MacNamara clan. Today the castle is part of the outdoor 'Living History' Irish Heritage museum at Craggaunowen. The ground floor extension was added in the 20th century by John Hunt as an exhibition space, who conceived the concept for the museum and donated his lands and castle to the Irish State. Oranmore Castle, County Galway, directly by the sea, was built as a Clanricarde stronghold probably in the 16th century. The castle had strategic importance as one of the 'gates' into Galway City. 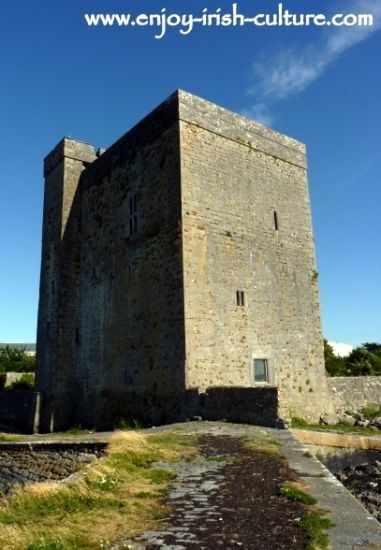 A high point in its' history was during the Cromwellian siege of Galway when the castle supplied the defending army. This is the Abbot's Castle at Kilmacduagh monsatic site in County Galway. 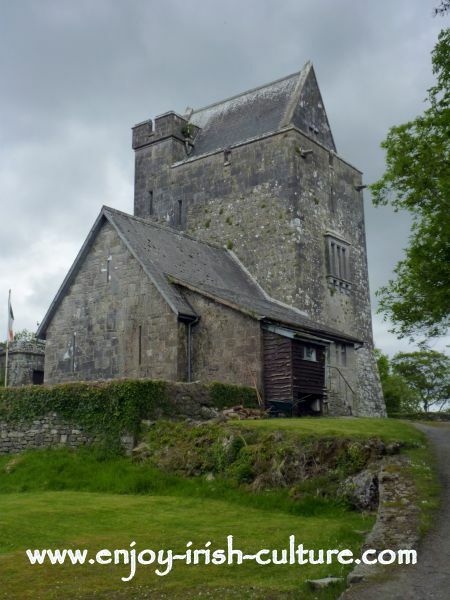 There often was a fluid boundary between monastic or church buildings and castles in Ireland. Medieval monasteries, too, often included defended structures as attacks on castles were very common! Kilmacduagh was an important and wealthy monastery and was attacked and plundered on a number of occasions. Clonbern Castle at Moylough in County Galway. 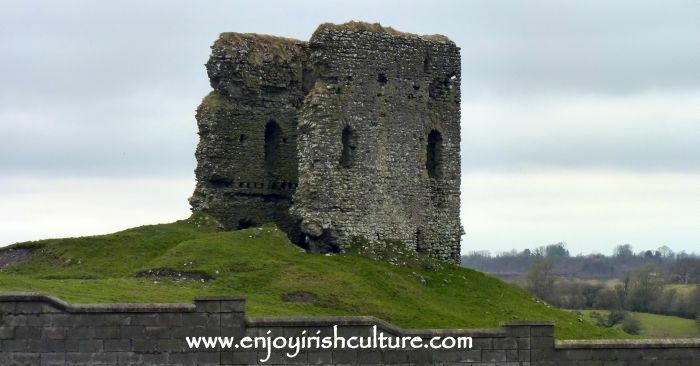 hope you liked our page on the tower house castles in Ireland. If you like what we do on this website, how about telling your friends so that they, too may find our website and enjoy our content. This is done easily using the social functions we provide at the top left as well as at the bottom of pages. Thanks a million and warmest reagrds from Susanna and Colm.